When most people think about their investment strategies, they first think of their money and where to put it. The last place many would consider is investing in themselves, but in reality, it’s a logical place to start. 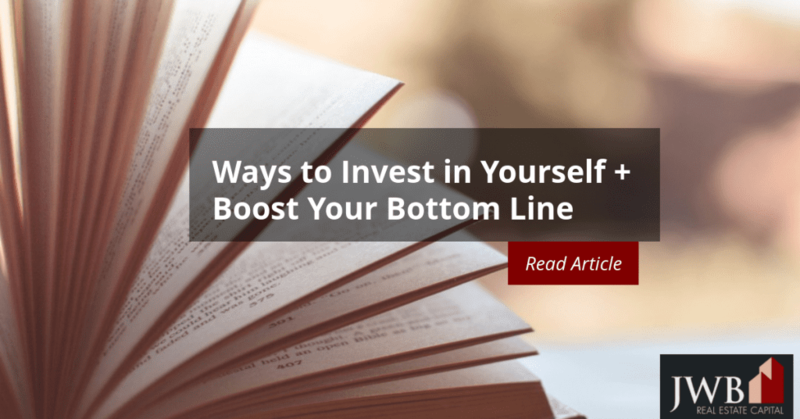 You’ll want to start and continue to invest in yourself since as a private investor, you have to provide your own support system to assure your growth and progress. Putting time and money into yourself to enhance your personal and financial success doesn’t have to cost a lot, and it can be an enjoyable process. You’ll feel and do better when you eat healthy, get plenty of sleep and don’t forget to exercise. Your performance will only be as good as your ability to think and act, and if a poor diet and fatigue are wearing you down, you won’t have the energy and clarity you need. Don’t skip time for relaxation and play. Time off spent in a way that’s personally rewarding for you will refresh and recharge you. Back in the 1920s, Henry Ford discovered that workers who had a five-day, eight-hour workweek had the same productivity levels as those who worked six days a week. Besides what you’ll learn about real estate in general and the law, it opens you up to networking with other agents. You will also qualify for a commission or fee if you are party to any transactions that end up in a sale. You’ll also be able to join the National Association of Realtors, which gives you access to the MLS listings, where you can explore both for-sale and for-rent listings for virtually anywhere in the U.S. Locally, you can find valuable data when it’s time to buy or sell a property, like time on market, a comprehensive list of home features, and asking price versus selling price. Reading books and online newsletters or listening to investment and real estate podcasts will help you grow as an investor. Libraries and bookstores shelves are lined with authoritative books on a variety of investment topics. Financing, investing, flipping, motivation, and legal issues are topics you’ll be able to explore in depth by reading or listening to recognized experts in the field. Online groups. Biggerpockets.com is a networking site for real estate investors around the country. They have over 800,000 members nationwide that can connect locally and nationally. You can search for other investors by zip codes close to you and connect online or in person. Besides providing a networking platform, this website provides forums, a blog, and their popular property analysis calculator. Local groups. Jacksonville’s Entrepreneur Group is a free group that sponsors various activities throughout the area that include real estate seminars and a wide variety of social activities. Network After Work has 4 million members nationally that interact with either primarily to network with others. The time you take to maintain your health and expand your social network with like-minded others will increase the energy you have as an investor. The knowledge you gain from the experiences of others through networking or reading will bring new insights to your business.